Water rehabilitation procedure with child with cerebral palsy. A kid dives in the water and grabbing a toy from the bottom of the pool. 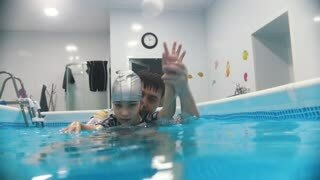 Water rehabilitation procedure with child with cerebral palsy.